On 3 September 2016, Google Malaysia issued a doodle in honour of what would have been Sybil Kathigasu's 117th birthday. 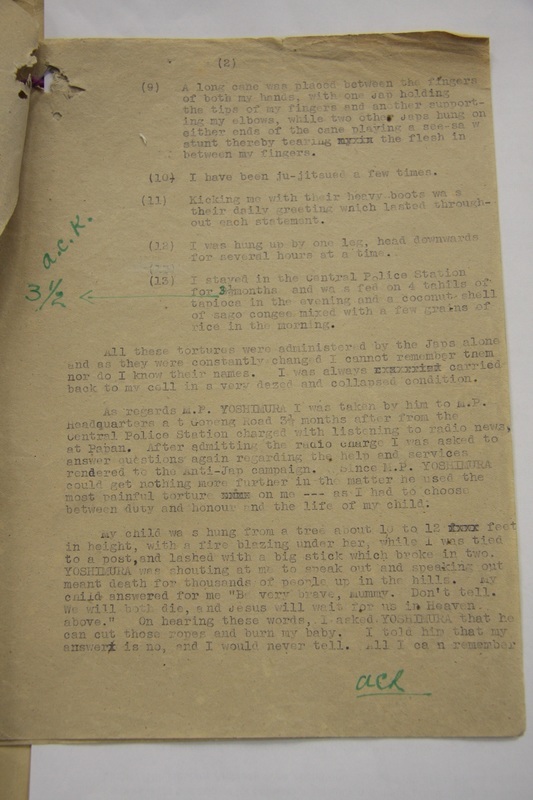 I wanted to add to that tribute as I had come across Sybil's affidavit, marked Evidence "C" in the war crimes trial file WO 235/837 at The National Archives UK. The accused was Sgt. Yoshimura Ekio. He was charged with the ill-treatment of Sybil, Sybil's 7-year-old daughter Dawn, and other unknown and unnamed "civilian residents" of Ipoh in the period of October 1943 to July 1945. Yoshimura was found guilty in a trial which lasted only three days, from 18 - 20 February 1946. The sentence of death by hanging was carried out at Taiping Convict Prison on 24 May 1946 at 6 a.m. Some lesser-known vignettes and factoids below, from what I have learnt about Sybil, in her own words, from her affidavit and through witness testimonies which were presented at court, and also from her autobiography, No Dram of Mercy, first published in 1954. Sybil's husband, Dr. Abdon Clement Kathigasu, was injured by shrapnel to his right leg during a bombing run by Japanese planes over Ipoh which strafed the population with machine gun fire. The Kathigasus turned the ground floor into a dispensary where they treated local ill and wounded, and later, guerrillas under the cover of darkness. One of the rooms eventually became an operating theatre. 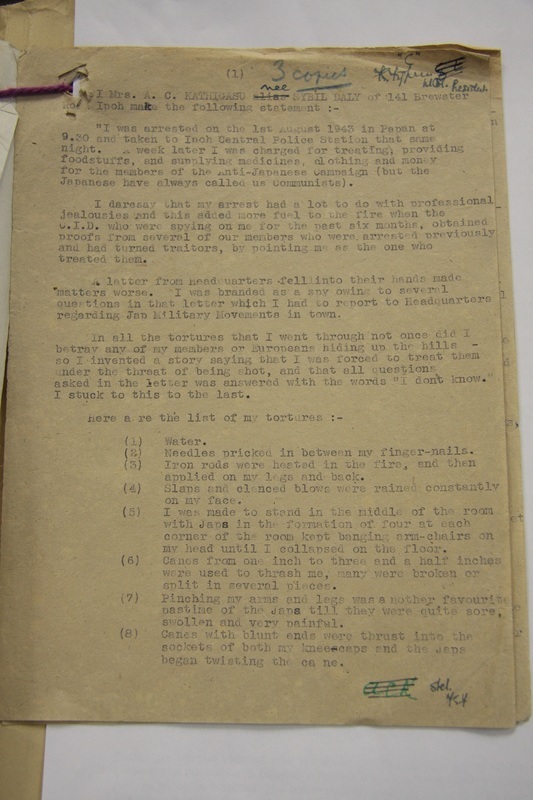 In her memoir, Sybil recounts an operation on a guerilla (whom she nicknamed 'Panjang' or 'long' on account of his height), who had a bullet lodged in his thigh and another in his shattered and septic ankle. The next morning, she had put the bullets in a bottle, sealed it and buried it in the garden. When Dominic asked her why she was keeping them, Sybil replied, "For a souvenir. We'll dig them up again when the British return." The Kathigasus youngest daughter, Dawn, was not yet six, when Sybil and Dr Kathigasu began covertly assisting the guerrillas. "Dawn," I said, "Do you love me?" "Of course I do, Mummy," and she put her arms round my neck and kissed me. "All those men who come here are soldiers who are sick and need medicine. They are fighting to save us from the Japs. If the Japs see them they will be shot. So they have to come at night. Nobody must know they are here. If somebody sees them come here, he might tell the Japs and these soldiers will be shot. Then Mummy will be killed too." "If they kill you, Mummy, I will die too." "If you love me, you must promise never to say a word about what you have seen here. These men are fighting for us. Whatever happens, we must never let them be killed." "I love you, Mummy. I will never tell anybody." "That's Mummy's brave girl. Jesus will protect you. From now on you shall always help me and be the youngest soldier of all." "When can I have a gun?" "We'll have to see about that later." 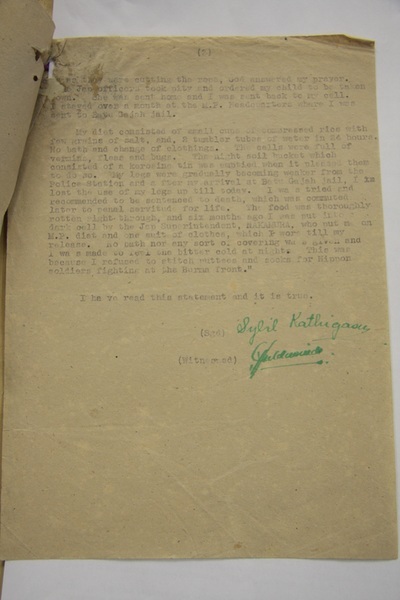 The Kathigasus covertly listened to the BBC to stay abreast of developments during the war. But this was risky business as wireless sets had been outlawed. A hole was made in the floor of the hiding space under the stairs; the unit was assembled and disassembled after each use; valves, transformers and other bits hidden in various places. Their first wireless unit was nicknamed 'Josephine.' When the unit broke down, they managed to procure another which had once belonged to a Father Cordiero and was hidden in the ceiling of a schoolroom. A Mr. Wong carried this unit to the Kathigasus hidden in a basket, under a layer of vegetables, on his bicycle. But the unit had only a short range reach, so it wasn't up the task, and Sybil had to return it to Father Cordiero in Batu Gajah, hidden in a basket of bananas. This she exchanged for a unit belonging to their friend George Matthews which was hidden in the priest's garden beside the church. In her memoir, Sybil describes the 'adventures' they had with hiding 'Josephine II' and fixing 'her' when its transformers blew out. But because "Josephine II remained a weakly specimen and was often in need of treatment," Sybil then arranged for a Philco unit to be sent to them in a wooden crate, "labelled as medicines." After their friend Raja helped set up 'Josephine III,' she "functioned perfectly and never failed to bring us news of the outer world, without which we might well have given ourselves to despair." 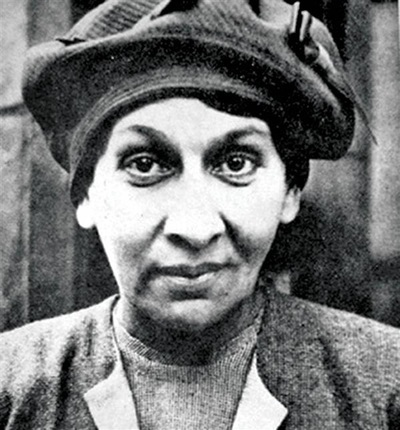 Sybil was betrayed by informants and arrested on 1 August 1943. (5) I was made to stand in the middle of the room with Japs in the formation of four at each corner of the room kept banging arm-chairs on my head until I collapsed on the floor. (6) Canes from one inch to three and a half inches were used to thrash me, many were broken or split in several pieces. (7) Pinching my arms and legs was another favourite pastime of the Japs till they were quite sore, swollen and very painful. (8) Canes with blunt ends were thrust into the sockets of both my knee-caps and the Japs began twisting the cane. (9) A long cane was placed between the fingers of both my hands, with one Jap holding the tips of my fingers and aother supporting my elbows, while two other Japs hung on either ends of the cane playing a see-saw stunt thereby tearing the flesh in between my fingers. (10) I have been ju-jitsued a few times. (11) Kicking me with their heavy boots was their daily greeting which lasted throughout each statement. (12) I was hung up by one leg, head downwards for several hours at a time. When Sybil would not break, her tormentors changed tack. "Since M.P. Yoshimura could get nothing more further in the matter he used the most painful torture on me -- as I had to choose between duty and honour and the life of my child. My child was hung from a tree about 10 to 12 feet in height, with a fire blazing under her, while I was tied to a post, and lashed with a big stick which broke in two. Yoshimura was shouting at me to speak out and speaking out meant death for thousands of people up in the hills. My child answered for me "Be very brave, mummy. Don't tell. We will both die, and Jesus will wait for us in Heaven above." On hearing these words, I asked Yoshimura that he cut those ropes and burn my baby. I told him that my answer is no, and I would never tell. All I can remember that as they were cutting the rope, God answered my prayer. Some Jap officers took pity and ordered my child to be taken down. She was sent home and I was sent back to my cell." Dr. A.C. Kathigasu later broke down during torture and confessed. Sybil was found guilty and sentenced to life imprisonment. She remained in Batu Gajah Jail until liberation. When the British reoccupied Malaya in September 1945, Sybil was flown to London to receive treatment for her injuries. Because Sybil was receiving treatment abroad, she was unable to give evidence in person at the war crimes trial. Instead, she submitted a signed affidavit. (Read her affidavit below) She also began her memoir to document her experiences but never completed it. Her injuries were so severe that at first, she was unable to walk. Ongoing treatment saw her regain the use of her legs, and she was able to fulfill a promise she had made to herself while imprisoned, and that was to go on a pilgrimage to Lourdes. She had hoped that when she regained her health more completely, she would be able to return to Malaya, her home. But in May 1948, she fell ill again, and the operations she had endured failed to stop the spread of septicaemia in her fractured jaw. She died on 12 June 1948. She was 49 years old. "My own acquaintance with Sybil Kathigasu began when she was in hospital in London fighting to recover her health. Fifteen months of almost incessant pain, recurrent operations, repeated disappointments and the constant strain of separation from all she knew and loved were as powerless to crush that brave and imperious spirit as was the Japanese Kempetei. She retained all her zest and interest in life and it seemed that once again the spirit would conquer the weakness of the flesh. Then, just as we all hoped and believed that a few more weeks would see her return to the family and surroundings she so dearly loved, with startling suddenness the end came... Proud, loyal and dominant and yet devout, humble and loving, she had many of the qualities that mark the great women of history. It is a privilege to have known her and an honour to have enjoyed her friendship." 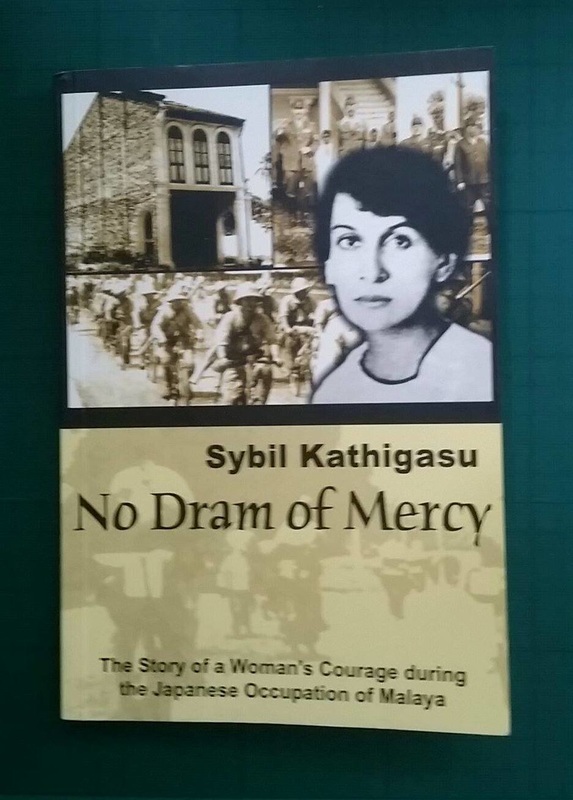 Sybil Kathigasu's memoir was recently updated and reprinted in 2006 by Prometheus Enterprise, ISBN 9832197228. Below: Some images from Sybil Kathigasu's affidavit, which was used to provide testimony during the war crimes trial of Yoshimura Ekio.